A version of “Notes on a Performance by Kellie Jones” is included in the book On Value (2015), an expanded record of Value Talks (2013–14), a series of private conversations and performances conducted at The Museum of Modern Art as part of Ralph Lemon’s Artist’s Research Residency, made possible by MoMA’s Wallis Annenberg Fund for Innovation in Contemporary Art through the Annenberg Foundation. “Notes on a Performance by Kellie Jones” is made possible by MoMA’s Wallis Annenberg Fund for Innovation in Contemporary Art through the Annenberg Foundation and was published as part of Triple Canopy’s Immaterial Literature project area, which receives support from the Andy Warhol Foundation for the Visual Arts, the Brown Foundation, Inc., of Houston, the Lambent Foundation Fund of Tides Foundation, the National Endowment for the Arts, the New York City Department of Cultural Affairs in partnership with the City Council, and the New York State Council on the Arts. Richard Pryor’s red tuxedo, Thelonious Monk’s “Ugly Beauty,” comedian Moms Mabley, and a meeting between Jean-Michel Basquiat and André Leon Talley. 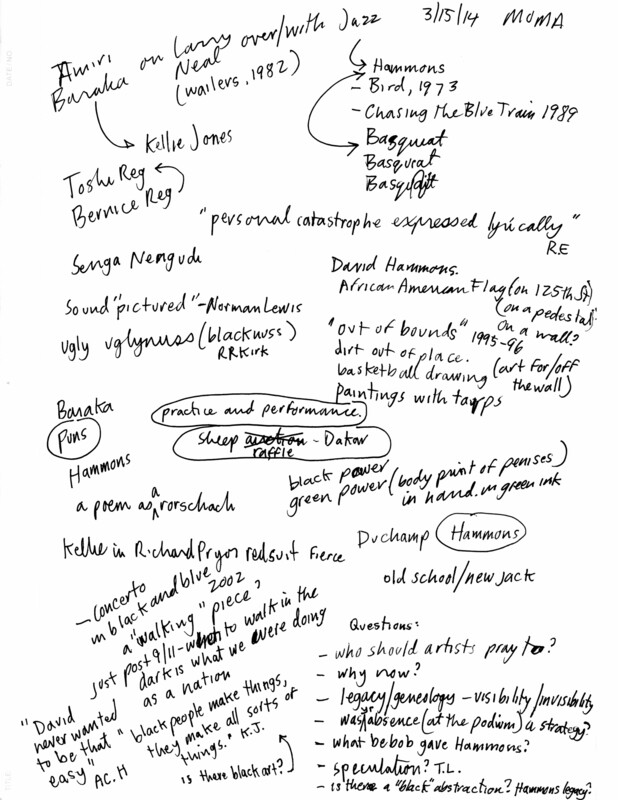 Annotations of a lecture by Kellie Jones on David Hammons. In the summer of 1982 I had an internship at the Studio Museum in Harlem. One day I was walking from the administrative offices in the front of the building to the artist-in-residence studios at the back when I noticed a framed print depicting the late dramatist and poet Amiri Baraka. Kellie Jones, who was an assistant curator at the museum at the time, happened to walk by as I was staring at the print. “Why do they have a picture of my father in the hallway?” she said, bemused. “Right, your father,” I responded. Then I realized that Baraka’s given name was LeRoi Jones. Embarrassed, I headed to the AIR studios to give David Hammons his monthly stipend check. Rahsaan Roland Kirk, Blacknuss (1971). To riff on a poster by the artist Carl Pope: “African-Americans, Negroes, Blacks and Post-Blacks All Agree: The Use of the ‘U’ Instead of the ‘E’ Changes Everything!” Change the joke and slip the yoke. Thelonious Monk’s composition “Ugly Beauty,” for example. Basketball drawings. Dirt as “matter out of place.” Mary Douglas, Purity and Danger (1966).1 Harlem dirt. Traveling dirt. Funky dirt. Nasty dirt. Where’d you get that funk from, huh? Went looking for the art and we were the art. A body print by David Hammons of soft green dicks. O’Jays, “For the Love of Money.”2 Mean green. She was absent and present at the same time, like Hammons: famously a no-show but sitting outside on a bench during the opening with his back to the museum because he is not for the museum, he is against it. Dissing the location. “DISLOCATIONS,” MoMA (1991). To not be easy. “Once the white folks started buying the work Hammons started making something else.”4 Miles playing with his back to the audience (also a better position to cue the band from). We’re the band. 1 “If we can abstract pathogenicity and hygiene from our notion of dirt, we are left with the old definition of dirt as matter out of place. This is a very suggestive approach. It implies two conditions: a set of ordered relations and a contravention of that order. Dirt, then, is never a unique, isolated event. Where there is dirt there is a system. Dirt is the by-product of a systematic ordering and classification of matter, in so far as ordering involves rejecting inappropriate elements. … Shoes are not dirty in themselves, but it is dirty to place them on the dining table; food is not dirty in itself, but it is dirty to leave cooking utensils in the bedroom, or food bespattered on clothing.” Mary Douglas, Purity and Danger: An Analysis of Concepts of Pollution and Taboo (London: Routledge, 1966), 36–37. 3 “Let Moms tell me what happened to me in the good old days. You couldn’t do nothing you wanted to do. And you better not open your mouth, and if you did they’d knock your brains out. They hit my brother so much … his lips were way down here. Looked like he had on a turtleneck sweater. … Think of somebody picking somebody you got to spend the rest of your days with. Make no difference what kind of condition it was in, if Daddy said so then that was it. I wasn’t nothing but a child. Nothing but a child, fourteen going on fifteen years old, and just as cute as I want to be. Hair hanging down my back—see I’m half Indian, and the other half, the beauty parlor takes care of that!—and this old, dead, puny, moldy man. I mean an old man. Santa Claus looked like his son. He was older than his mother … and his brother was older than him, and he married a girl of thirteen. Didn’t live more than five days. [Even when he was dead they couldn’t get] the smile off his face.” Moms Mabley, Live at the Apollo, Paula Records, 1994, compact disc. 4 Kellie Jones, “On David Hammons, Or the Presence of Art and the Absence of the Artist” (Value Talks, March 14, 2014). 5 “It is now less convincing than ever to speak of black artists as if they share an enterprise. The work of black artists for whom questions of culture are a subject but visualizing or representing race/identity is not an end obligates us to displace race from its central location in our interpretations of this work. … It obligates us to expand our view of the many contested fields of possibility out of which ‘black art’ is seen to come, so that we might accommodate in our interpretations all that the work engaged in order to be possible.” Darby English, How to See a Work of Art in Total Darkness, (Cambridge, MA: MIT Press, 2010), 11–12.